This post covers the two Anniversary Issues of 1982 and 1983. Both issues contain five stamps covering a range of centenaries, anniversaries and commemoratives. Each stamp is attractive, interesting and has a story to tell. 20c - Centenary of Tauranga. 20c - Centenary of Hawera. 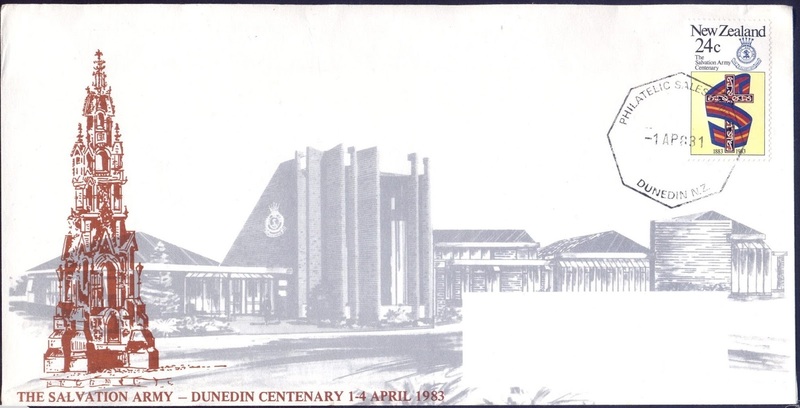 20c - Centenary of Tauranga. Featured is the Tauranga Mission House, built over the period 1838-1847, which was an integral part of Tauranga's early history. Sailing boats with Mt Maunganui in the background are also depicted identifying Tauranga as an ideal place for holidaying and boating. In fact, the English translation of the name Tauranga is "safe anchorage". 20c - Centenary of Hawera. 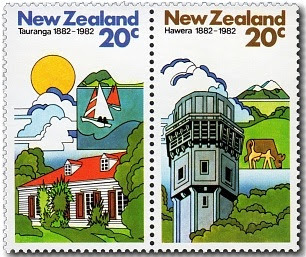 Hawera's water tower, built to provide the area with a permanent source of pressurised water, is featured in the foreground of this stamp. The background inset shows Mt Egmont /Taranaki and a grazing cow, the latter giving recognition to the area's extensive dairying activities. 25c - Centenary of the SPCA / Society for the Prevention of Cruelty to Animals. 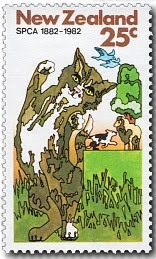 1982 marked the centenary of the SPCA in New Zealand, whose creed embraces domestic pets, rural animals and wildlife, all of which are featured on the stamp. 30c - Centenary of Frozen Meat Exports. 'The Dunedin' was the first ship to take frozen meat cargo from New Zealand to England. 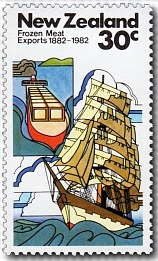 Commemorating the centenary of this event, "The Dunedin" and a modern container ship are shown on this stamp. 35c - United Nations International Year of Science. The United Nations designated 1982 as the International Year of Science. 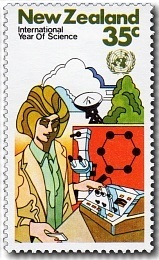 Featured on this stamp are some of the equipment used in scientific research and applied technology together with the symbolic representation of the theoretical aspects of science. 1982 Anniversaries - First Day Cover. The 1983 Anniversaries / Commemorative issue consisted of five stamps; three centenary stamps, one marking World Communications Year. 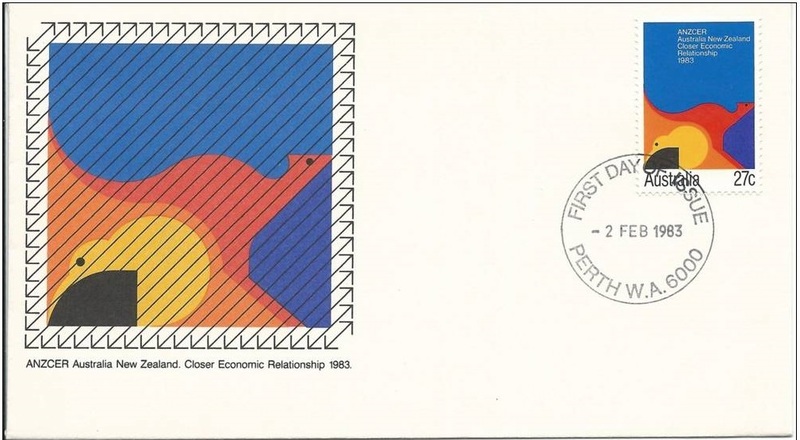 and a joint issue stamp commemorating Closer Economic Relations with Australia. 24c - Centenary of the Salvation Army. 30c - Centenary of the University of Auckland. 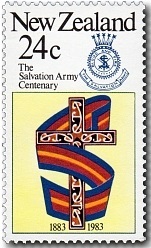 This stamp incorporates the special centenary logo designed by a Salvationist of the Wellington Citadel Corps, especially for the occasion. The logo depicts the traditional symbols of Salvationism in modern style. The Maori koru design on the cross is representative of new life arising out of that which has gone before. In the upper right of the stamp is the international crest of the Salvation Army. 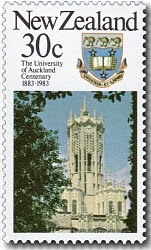 Depicted on this stamp is the University of Auckland 's old arts building with the coat of arms featured on the upper right. The coat of arms bears the motto "ingenio et labore" freely translated as "by natural ability and hard work". 40c - Centenary of the Introduction of Rainbow Trout to New Zealand. 45c - World Communications Year. 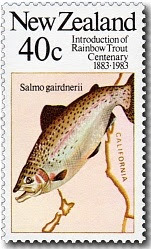 In 1883, rainbow trout 'salmo gairdneri' were introduced from Sonoma Creek in California, United States of America. Commemorating the centenary of this event is the stamp design showing a map of New Zealand and part of the state of California. Rainbow trout are the most sought-after trout in the world because of their renowned fighting qualities. This stamp recognised the importance of communications infrastructures as an essential element in the economic and social development of all countries. 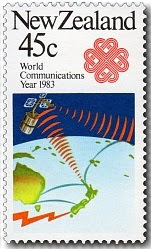 The stamp design illustrates the encompassing power of satellite communication over the Pacific region. The logo of the World Communications Year is included in the top panel of the design, radiating lines represent the different communications associated with Intelsat IV satellite whilst airmail lines are also shown. First Day Cover (all five stamps). 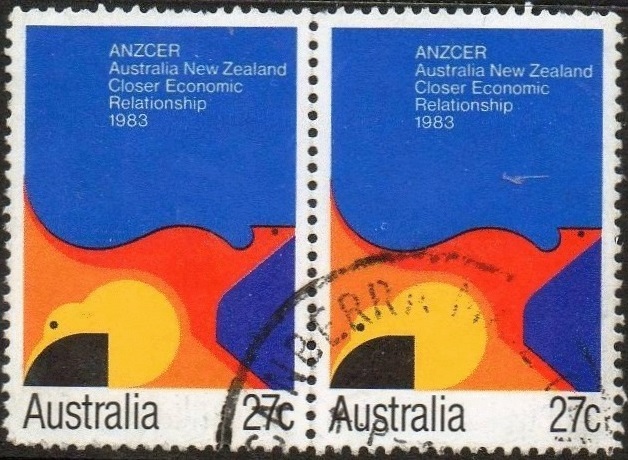 35c - Australia NZ Closer Economic Relations (ANZCER). This stamp, commemorating Closer Economic Relationship with Australia, was designed by G Emery and printed by Cambec Press, the same stamp design was issued in both Australia and New Zealand. 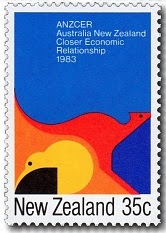 The stamp shows a kangaroo and kiwi in stylised form, marking the signing of the Closer Economic Relationship (CER) agreement with Australia. The Australian Post Office also issued a stamp with the same design to commemorate the agreement. The 35c was a slightly different size to the other stamps in this issue because it was designed to fit with the joint issue Australian stamp. Above is a used pair of the Australian stamp and below is the Australian First Day Cover. 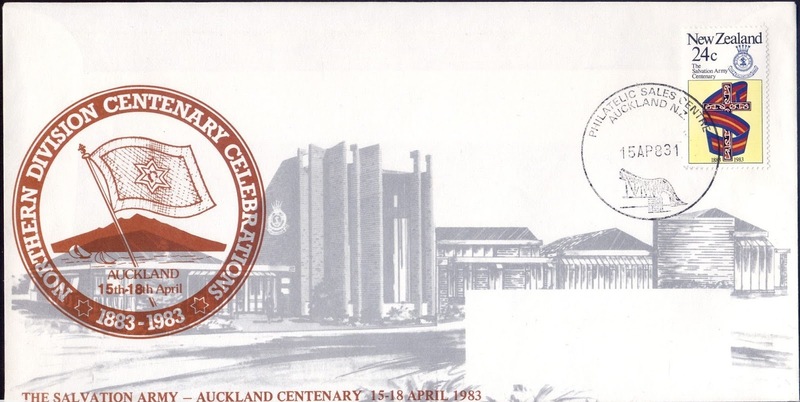 The actual Centenary of the Salvation Army in New Zealand was held on different days in different parts of the country. Here are three special covers designed for those events. 24c - Centenary of the Salvation Army - Auckland Cover 15-18 April 1983. 24c - Centenary of the Salvation Army - Dunedin Cover 1-4 April 1983. 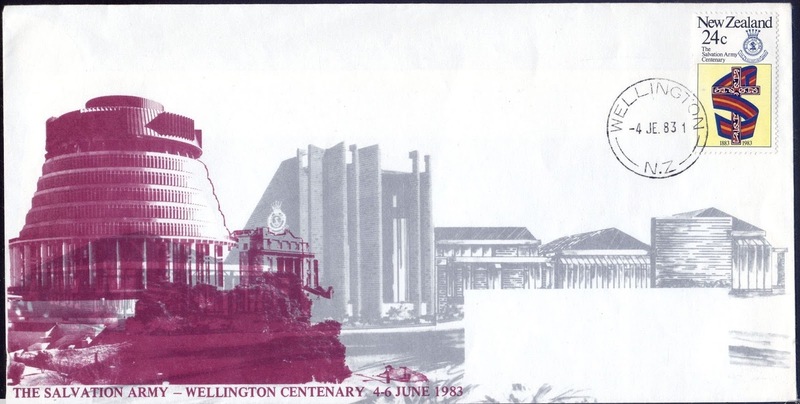 24c - Centenary of the Salvation Army - Wellington Cover 4-8 June 1983. Technical information - 1982 Anniversaries / Commemoratives. Technical information - 1983 Anniversaries / Commemoratives.